This has been introduced in E-Prime 3.0.3.60 (Update 1). Use of the Microsoft Basic Display Adapter can result in poor timing when running your experiment. The Microsoft Basic Display Adapter is sometimes enabled whenever you update your Windows version (e.g., Window 7 to Windows 10). After being updated, your machine uses the Microsoft Basic Display Adapter as the default adapter until another one is found. The Microsoft Basic Display Adapter uses a refresh rate of 64 Hz by default. It does this even if your monitor is not capable of 64 hz which can result in timing and runtime errors. Update to a manufacture driver that is DX capable and compatible with E-Prime (see INFO: E-Prime 2.0 SP1/SP2 requires specific DirectX 11 settings ). Roll back your machine to the previous Windows version that did not produce the error in E-Prime. 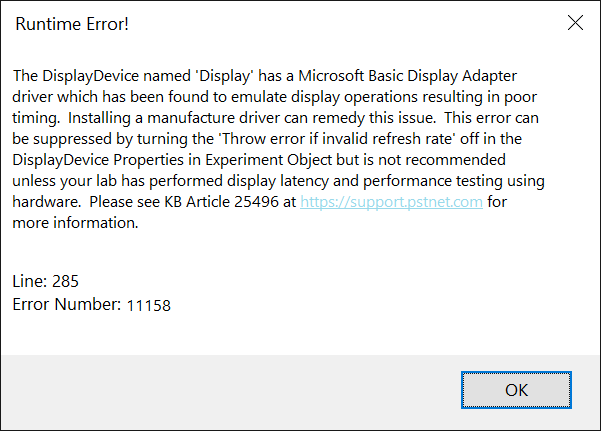 Although not recommended, this error can be suppressed by turning the 'Throw error if invalid refresh rate' off in the DisplayDevice Properties in Experiment Object. However, Psychology Software Tools does not recommend suppressing the error. This can lead to poor timing data. Data should only be published for studies of this nature if it is stated that the warning was turned off and inaccurate display timing occurred.